This image is copyrighted by The Ansel Adams Publishing Rights Trust and cannot be printed or reproduced in any way. The use of the photograph is limited to viewing in the context of this web site. A. Why do you think this is the most famous photograph by Ansel Adams? B. How did chance lead him to take this photograph? C. How did scientific analysis of the moon help Adams date this photograph? D. How important is "the moment" in photography? E. Once the photograph is taken, is the development and printing a mechanical process? What do you notice first? The white clouds? The moon in a black sky? The white gravestones? The mountains? What feeling do you get from all these elements put together? Do you notice how the photograph is divided according to the "Rule of Thirds?" Many artists believe it is boring to look at images that are absolutely symmetrical, with images divided exactly in half. 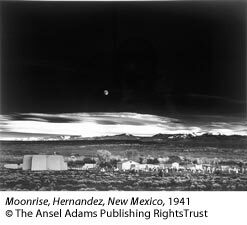 In Moonrise, Adams has stimulated our eye by offering three layers, each with a different tone: the black sky, the white clouds, and the gray landscape. Adams made an interesting composition, which became very popular. Moonrise is "certainly my most popular single image", said Adams. It "combined serendipity and immediate technical recall." Serendipity means lucky chance. He "felt at the time it was an exceptional image" and when he took it, he felt "an almost prophetic sense of satisfaction." Are photographs sold like paintings? What value do they have? There are patrons and collectors of photographs as well as for other fine arts. Ansel Adams was lucky to have attracted many influential and wealthy people who financed the production of the portfolios of his work, who arranged for exhibitions, and who purchased his work. When he was a young creative photographer, his original prints sold for $10, and in the 1960s for $50 - $100. The price for a print of Moonrise in the early 1970s was $500. Then the value of the creative photographs of Ansel Adams skyrocketed. At an auction in 1981, the sale of Moonrise set a record price for a photograph - $71,500! I could not find my exposure meter! The situation was desperate: the low sun was trailing the edge of clouds in the west, and shadow would soon dim the white crosses." He felt at a loss to guess the correct exposure, but suddenly realized he knew the luminance of the moon and quickly took the shot. Adams said he often disregarded the dates of his negatives, causing dismay among historians. Moonrise was dated anywhere between 1940 and 1944. "Dr. Elmore of the High Altitude Observatory at Boulder, Colorado, put a computer to work on the problem. Using data from a visit to the site, analysis of the moon's position in the photograph, and lunar azimuth tables, he determined that the exposure was made at approximately 4:05 P.M. on October 31, 1941." Adams and wanted to take a second shot because he realized he had "an unusual photograph which deserved a duplicate negative." But he was a few seconds too late! "The sunlight passed from the white crosses." It can be very frustrating for a photographer to miss an expression, a movement, or the right light. Luckily, conditions were just right for the one precious shot and Moonrise is the fortunate result. Adams said it "is a romantic/emotional moment in time." No, it is not mechanical. Although there is a procedure, there is much judgment involved on the part of the artist. Ansel said that the negative for Moonrise was difficult to print. He tried many methods using different chemicals and times and papers. With the negative in the enlarger, he increased the light hitting certain areas (burning-in) which made the sky blacker and the clouds less bright so the moon would stand out more. With all these artistic adjustments, Adams said "it is safe to say that no two prints are precisely the same." Lens: Cooke triple convertible lens. Exposure: 1 second at f/32. Development: dilute D-23 and ten developer to water sequences. Years later - refixed, washed the negative, and treated the lower section with a dilute solution of Kodak IN-5 intensifier. See Bibliography for more material by and about Ansel Adams. For more information on the technical aspects - cameras, films, lenses, filters, darkroom techniques, printing, papers, etc. - please refer to Examples, The Making of 40 Photographs by Ansel Adams (Boston, Toronto, London: Little, Brown and Co, 1983). See Glossary for definitions of vocabulary words and photography terms.